But maybe this is just the start of something beautiful. Gruden certainly hopes so. When asked if Peterman, released by the Bills last month after a historically inaccurate season, could be with the Raiders for a while, including next season, Grudes was optimistic. Oh hell yeah, hell yeah. If anyone can get Peterman on the right track, its the QB Whisperer himself, who took the Derek Carr who’d made three straight Pro Bowls and turned him into, uh, the guy who leads the NFL in checkdowns. There are financial reasons to think McCarron won’t be back as Carr’s backup next season: As NBC Sports Bay Area notes, McCarron’s due a $3 million roster bonus on March 15, which could make him too pricy for the Raiders’ tastes. Enter Peterman? Lord, we hope so. Peterman is ready to walk in and be a contributor from day one. He just looks like a pro quarterback — coming out of the huddle, running an offense with different formations, shifting, motioning, different patterns that other colleges don’t run. Peterman will recognize route combinations and associate formations. Most importantly, he will be able to get in a huddle from day one and look at 10 grown men and tell them where to go and what to do and handle a versatile snap count. Well Grudes, it’s time to put your offense where your mouth is. Peterman forever! 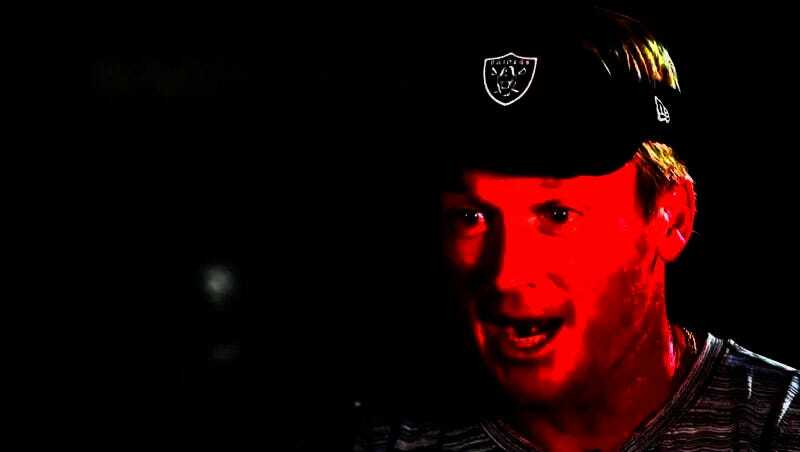 Jon Gruden: I Get A Ton Of Calls From Players Who Are "Dying To Come And Play Here"